Now that we’ve had a week to reflect on the college football season after a dominant performance by the Alabama defense, we’ll take one last look at the uniforms for these special games. It comes as no shock that I’ll lead off with Oregon and its very shiny helmets for the Rose Bowl. 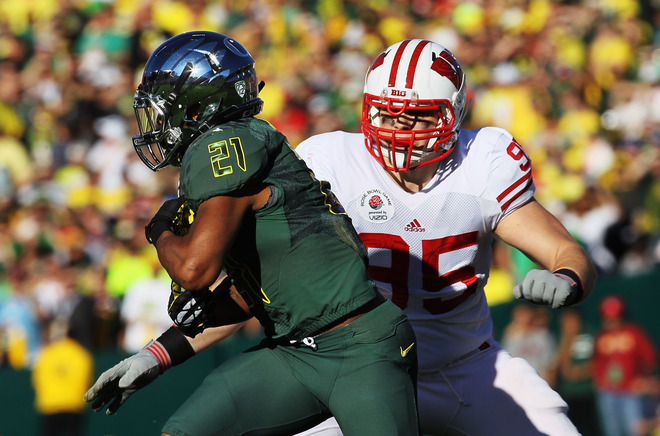 It’s a wonder Wisconsin did not complain it couldn’t see as the Ducks ran out in the Pasadena sun light wearing what more closely resembled solar paneling than a football helmet. Overall, I thought the look was neat and innovative for even Oregon. The use of “liquid metal” for the helmets and facemasks was cool to see. It added another dimension to the beauty of the setting for the Rose Bowl. It was also very cool to see the reflection of the field and the mountains surrounding the Rose Bowl whenever ESPN gave the audience a close-up view of the helmet. Oregon’s helmets worked for the most part, but the one drawback was the helmet had virtually nothing to do with the uniform. I understand it would require a completely silver uniform for the Ducks that might have blinded the 100,000 in attendance, but it’s justa pet peeve I’m airing here. 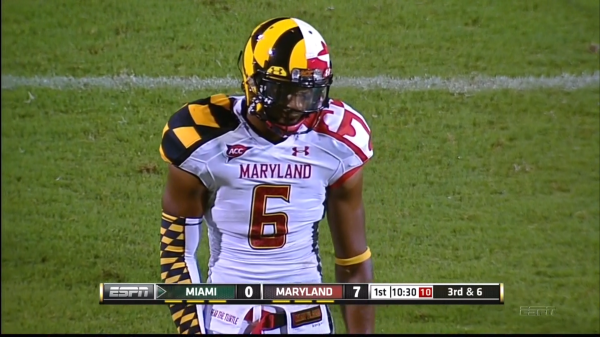 Wisconsin also brought a subtlety to the game with the helmets. 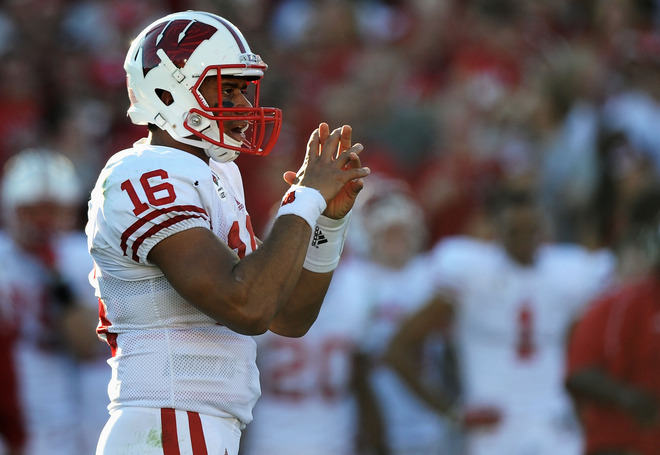 If you look really close, you can see the pattern of a rose in the W of the Badgers’ helmets. It’s stuff like that, that makes the Rose Bowl great. The game presented a contrast of style in both style of play and general style. It was neat. 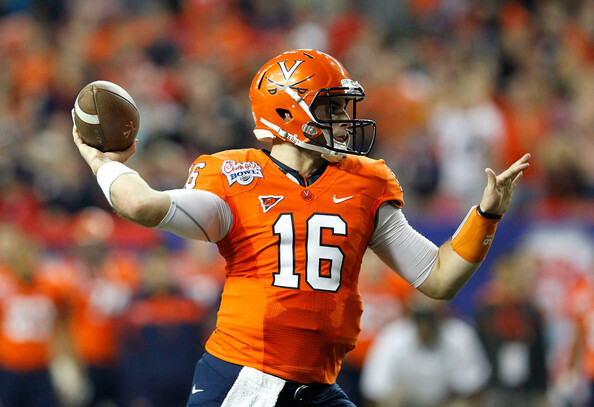 Virginia went with a frighteningly bad look in a blowout loss to Auburn in the Chick-fil-a Bowl. I have no idea what the Cavaliers were going for. Maybe they thought since the game was being played on New Year’s Eve night, everybody would be too drunk to notice. Luckily for this blog, I work on Saturday nights so I noticed. 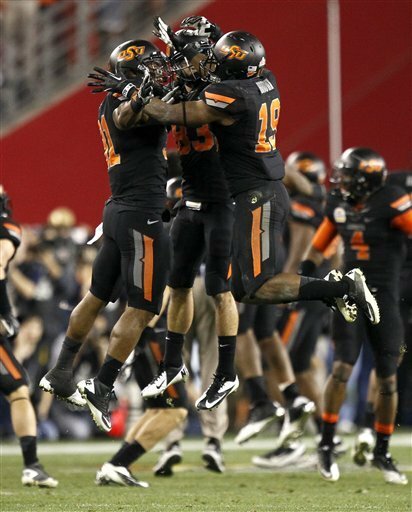 Oklahoma State went all-black in their Fiesta Bowl victory over Stanford. I still wish they would go with orange and white one time. This look made it seem like it was Halloween, not New Year’s. Baylor more closely resembled the old New York Jets than the Baylor Bears in the Alamo Bowl, but I guess it helped them score a lot of points so that’s great. Notre Dame wore names on the back of their jerseys for the Champs Sports Bowl so there’s that. 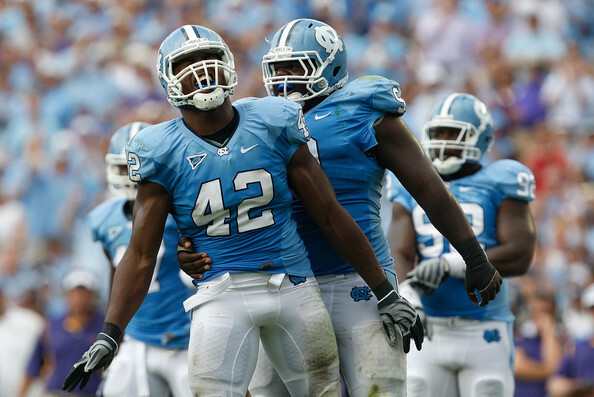 The players at North Carolina are clearly pretty psyched to be ranked at the top of the ACC. Ok, so we are getting down to the wire here, but for time concerns, we will keep this brief when breaking down some of the fashion from the Atlantic Coast Conference. Carolina blue has become iconic with the Tar Heels, but mostly on the basketball court. The football Tar Heels employ the interlocking N and C on their helmets. 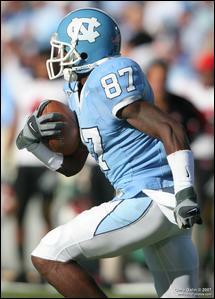 The Carolina blue in the home uniform is one of the best colors out there. The only thing that keeps this from being among the elite is the small and sometimes thick blue stripe on the side of the pants. 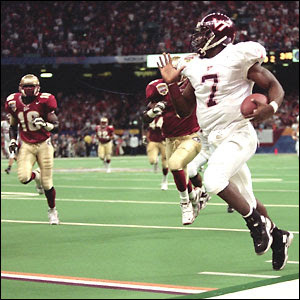 In recent years, the Hokies have gotten more creative with their uniforms. 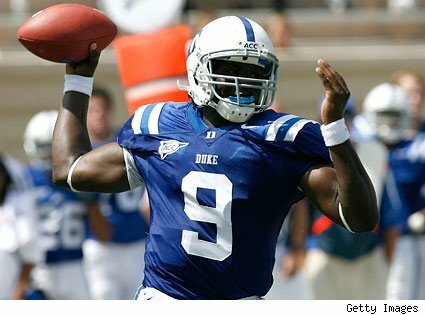 There have been some throwbacks and stripes on the shoulders added on to what used to be a pretty boring uniform. The Tigers have an all-orange look for home games, but unlike some other teams that go with all bright colors, the look isn’t to offensive, but it actually works. The Tiger print on the helmet is also pretty cool. The Hurricanes have taken on the city of Miami’s bright color scheme for a long time. Now the Marlins are adopting the same look (maybe since they’re playing at the site of the old Orange Bowl.) The iconic ‘U’ on the helmet has been around for years and makes the helmets a solid look. The red and gold the Seminoles use is a good combination. The arrow on the helmet and the helmet stickers of the same design give them the details to make the uniform fun. 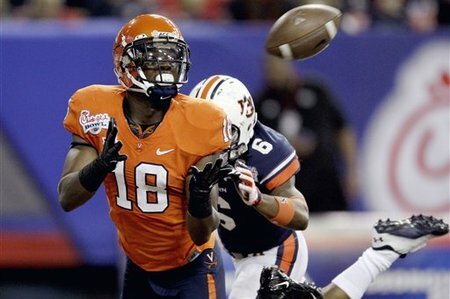 The best part of the Virginia uniform is the helmet. The V with interlocking swords is very cool. The Yellow Jackets are one of the rare teams in college football to wear white at home, most of the time. It’s not like their colors are dark anyway, a gold uniform could be used as road look if they really wanted. The Terps tried to become the Oregon of the east coast this season, but it simply did not work. The uniform combinations were not all that inspiring and couldn’t match the Ducks. The saving grace for the Blue Devils here is their white helmets and stripes on the shoulder. I’m a sucker for both. I don’t know, this is a pretty plain look. It’s a classic uniform, but they haven’t had to success on the field to make it iconic. The Demon Deacons have an extremely boring helmet which really hurts these uniforms, all they have to do is perhaps get a little creative with the logo. Nothing too much to talk about here. The small N and C in the big S are pretty neat though.